Your full-day tour from Toronto takes you in air-conditioned comfort through the breathtaking scenery of the orchard-laden Niagara Peninsula to Niagara Falls. Time permitting you will also stop at a local winery for wine tasting. You'll also drive through the historic community of Niagara-on-the-Lake. When you arrive at the falls you'll take a truly amazing, wet and wild boat ride to the base of the thundering Horseshoe Falls on the Hornblower Niagara Cruises boat. 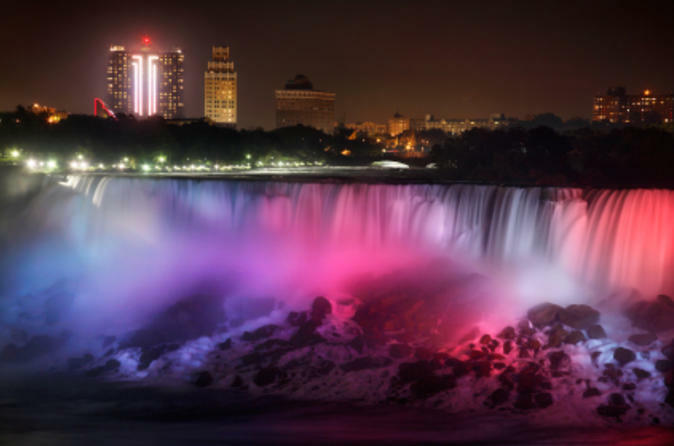 After your buffet dinner with views at the Fallsview Dining Room, you'll stand on the brink of the falls to view the nightly multicolored illumination show. Visit on a Friday, and the illuminations show includes a free fireworks display over the mighty Niagara Falls. This tour is seasonal, operating from June through to September.